All the insects that I'm posting were taken in my garden and have just started with insects so need a lot of help. This is another small insect 1/2" or so. ID would be appreciated. I feel like I know a couple of you guys that have named a few for me. note slender shape, metasomal color pattern, etc. 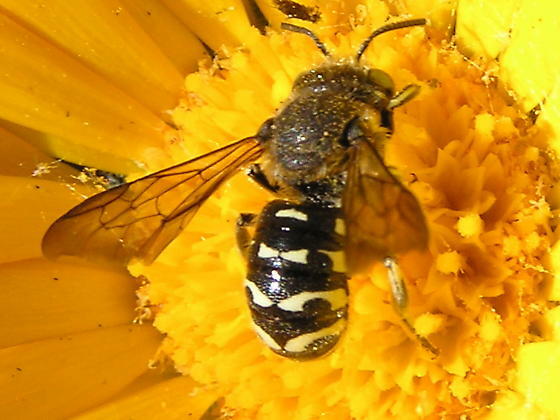 This is a megachilid bee, genus Anthidiellum most likely. They are among the "resin bees" that construct little cells of sand or pebbles, held together with plant resins and attached to twigs, or beneath rocks, etc. Neat insects! Thanks so much for your help Eric and the time you spend looking at the posts.